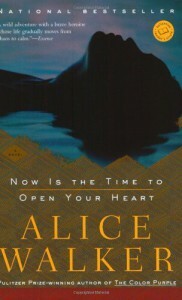 This is my first Alice Walker novel, so my expectations might have been a bit too high. I think if it had been a first novel from a new author, I would have been pleasantly surprised, but when I picked this one up I was kind of hoping for a dazzling work from a master author late in her career. I liked reading a novel about a woman who is over 40, unmarried, black, confident, and not yearning for a romantic relationship. It seems rare to read about an older woman on a quest outside of chicklit or romance, and I was thankful for that. However, the novel on its own was just okay for me. I am interested in quests, spiritual awakenings, and consciousness-altering experiences, but I found the novel's loose structure (I didn't easily follow the jumps through time and location) and lack of focus to be confusing. The novel felt ethereal and abstract, which was worse when some of the story was told through a dream or a parable. I found myself wanting more detail about people's lives and experiences, but the text hovered in a meta space, describing each character's spiritual revelation without giving me much to hold onto about the character him/herself. As one reviewer commented, "Every character has an epiphany on pretty much every page." And after the epiphany, we generally don't see that character again: it turns out they were arguments for the novel's philosophical point more than they were characters. It's hard to even say if Kate is transformed over the course of the novel because we don't know her at the beginning and we don't know much more about her at the end. Overall, it had the effect of a poem that didn't connect, and I got the sense that while she was writing this, Walker wasn't that interested in writing a novel. At points the book felt like it was trying very hard to be wise, and I would rather have received its wisdom through the story than directly (mostly from the shaman Armando). The novel repeatedly tries to push individual insights (such as that Rick's spiritual pain comes from his family history of selling addictive street drugs to black people) into the framework of the novel's argument, which is that our disconnection with the spiritual world (called "grandmother" throughout) has led to the moral depravity of our culture and the suffering of the most vulnerable. I'm not sure how this applied to Kate, who is not vulnerable, or even particularly in need of wisdom at the beginning of the novel. She is already out of the relationship that she felt was suffocating her and into a new one, and she is apparently completely free of responsibilities in her life like childcare or employment. She doesn't seem to be in any type of crisis, so she doesn't seem to have a reason for taking a break from her life to go on an Amazonian spiritual retreat. But like I said, we don't really get to know her. Maybe she just felt compelled? Overall, I found it hard to connect with this book enough to like it. I think I would have preferred an essay from Walker on why we should collectively embrace native Peruvian approaches to nature and spiritual in order to heal ourselves. By framing that idea in a novel I felt she was trying to cover the argument -- which is what she really wanted to talk about -- with fiction, and it felt dishonest. I'm open to a discussion of what we can learn from how other cultures maintain spiritual and ethical balance, and I'm even open to hearing that argument in the form of a novel, but I felt like in this case the novel was neglected in favor of making a point. Even when the book was putting forward ideas that I agreed with, I felt like I was being told what to think, not to open my heart.